This year, the Christmas season compulsion to spend now, worry later has collided with a recession that has left many people unable to indulge. By and large, New Zealanders are broke. Oh, the bank economists remain in denial and keep telling us the real reason we’re not spending is because we’re thriftily deciding to pay off debt instead. Even if this were true, it would be deeply ironic – given that just before Christmas, the government expanded debt by borrowing a whole lot more money to pay for the tax cuts that we plainly couldn’t afford in the first place. While telling us we all have to tighten our belts, reduce debt and live within our means. Right. Gotcha. Who would want to be a music retailer in this climate? Obviously, music is an area of discretionary spending where the options are literally, free. Add up the impact of legal and illegal downloading, the ripple effects of fierce discounting by the major chains, and the fragmentation of the audience into a myriad sub-genres.. and you have to wonder whether there is any future for the bricks and mortar business of running a record store. Currently, music retailing seems to be more about mere survival, not profits. 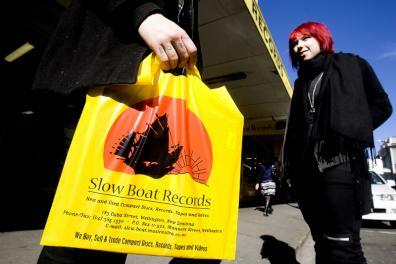 Moreover, music retailers are having to run faster and faster, in order to achieve those declining returns. In the same report, the first quarter unit sales for New Zealand music are cited as a percentage of the total market, thereby making it a simple exercise to compute and compare first quarter 2009 and 2010 unit sales for the entire market. Much the same applies with legally downloaded single tracks. Some 1,075,668 singles were downloaded in 1st quarter 2010 compared to the 656,577 downloaded in the same quarter a year before. Overall, less money is now being made off more album units and singles sold – and that unhappy situation is a product of the erosion of margins due to the impact of (a) discounting and (b) the lesser impact of legal downloads, via the likes of iTunes. While the public is definitely buying music online, the traffic is still relatively light. As has been demonstrated in the US with the decline in DVD sales, the profits that are being reaped from digital downloads are – as yet anyway – considerably less than what used to be recouped from hard copy sales in stores. Australian listed retailer JB Hi-Fi, has also revealed that it is finding the [New Zealand] market a tough one to crack. With just 10 stores in New Zealand at the end of June, JB Hi-Fi said in August that it had increased its losses during the year from A$2.9 million to A$3.5 million. It has blamed fierce competition and a lack of scale for squeezing its margins. …Trading at the Red Sheds reflected “a very difficult trading environment for retailers with recovery in overall consumption remaining subdued and patchy. Helping to weaken sales was a $13 million decline in sales of music CDs and DVDs. That reflected a broader downturn in the sector, as consumers increasingly switch to online sales. Caught in an interesting place somewhere in the middle are Marbecks. After buying out the Marbecks family in 2007, the previous owners of the CD and DVD Store chain re-branded the entire chain as Marbecks, and while the chain owned 30 stores as of mid 2010, the corporate plan appears to be to consolidate into a smaller number of larger stores – configured as book/CD/DVD/videogame outlets with options for customers to download music onsite, and café facilities attached. There will no doubt be more smaller store closures over time, we believe our future is in larger concept stores that create communities that can meet and share our passion for music, movies, books and art and coffee – and online and digital of course, they are, and will be, a significant part of our business in the future. So much for economics. Not many people care a toss about the fate of the chains and the chains’ lack of a human dimension will ultimately be another reason for their eventual demise. Traditional record stores, though, are something else again. For much of the last 30 or 40 years, they’ve been a key part of the cultural landscape. 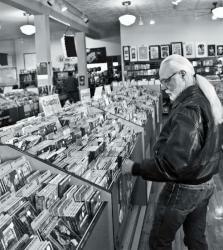 People hung out in record shops because being around music felt good, like being on hallowed ground. A good record shop was a cultural home away from home. 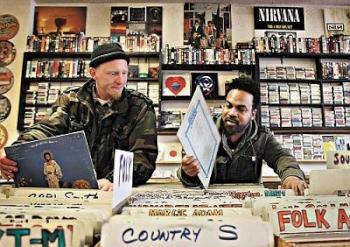 In early November one of those kind of places – Records Records in Dunedin – closed down. In other words, albums are – or used to be – a sort of fetish object, one step up and a decade onwards from the swap cards in the school playground. With that in mind, I asked a couple of old school record shop owners how they were faring in what may be the twilight years of their line of business. Mark Thomas, Real Groovy, Wellington. Mark Thomas was a long time manager in the Real Groovy chain until it hit the wall and went into receivership. In October 2008, he bought out the Wellington store which is now an entirely stand alone operation. Except – oddly enough – for the name. The name is still owned elsewhere so he can’t use it say, online. “People think when they’re buying off the web that they’re buying from us. 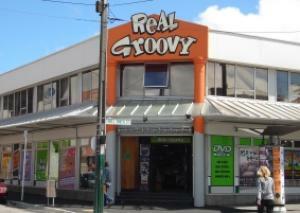 But they’re buying from Real Groovy in Auckland…” Still he says, it’s a good brand to be associated with, overall. Potentially, the chains pose a genuine threat to Real Groovy, JB Hi Fi does in particular, in that it not only stocks the mainstream fare at discount prices, but also has large sections devoted to the sub-genres that Real Groovy has tended to service. Does Thomas see them as a threat? The evidence is right there on the shelves. 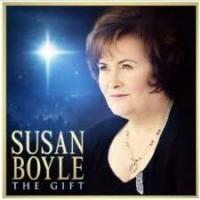 Susan Boyle’s new album retails at $29.95 at Real Groovy, and only $24.95 (or less) at the chain outlets. That’s the outcome, Thomas explains of the chains being able to bulk buy their copes at $10 to $12 a unit – which can make even $16.95 retail prices an option for them. By contrast, Thomas and similar store-owners are having to buy the likes of the Boyle album at $18.50, which in turn means – when the lower volumes are factored in – that he has to retail it at $29.95. In the face of such realities, Real Groovy can only wish and hope the chains will end up eating each other, without him being part of the collateral damage. These days, Thomas is moving the store inexorably back towards its real strength : second hand CD sales. At the time he took over the store, Thomas told NZPA that new CD sales comprised only 28% of his business. These days, second hand sales form an increasing part of the store’s business and core identity. Which is? Well, Thomas explains …the niche identity of Real Groovy Wellington doesn’t strike him as deriving so much anymore from it being an alternative music store, though he sees that as still being the image that the Auckland store continues to project He sees his own operation primarily as a pop/rock record store with a strength in second hand sales, and offering with the full range of cultural products – T-Shirts, flags, books, CDs, videogames, DVDs and Blu-Ray. Unit sales in DVDs and Blu-Ray are up, he says as an aside, but the profit margins are slimmer. Going back to the shop’s re-positioning on the pop/rock centre ground ….that’s mainly because, he says people who like certain other subgenres these days – alternative music, hip hop and r&b – are mainly getting their music via downloads. Leaving him by default with pop/rock. jazz, country and world music. Not that he’s entirely certain about that. “In a store like this when you’ve got over 60 suppliers and 50 different departments – it gets hard to gauge where its working and where its not.” Some 80,000 changing items are moving through the store at any given time. “Its quite hard to get that perspective on what’s really working for you. We’ve got a really good idea now, and it will be a matter now of refining what works for us. With CDs, there’s been something of a revolution in the prices people are willing to pay. “A few years ago, people were willing to pay $34.95 for a CD or $29.95. 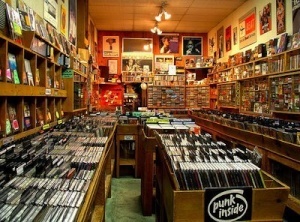 Now, if there’s an option for them to get it for nothing illegally or at a cut price, they’ll take that option.” As a result, $ 14.95 and $19.95 are becoming the new ceiling for what many people are willing to pay for a CD : “ which ties in well with our second hand market.” Record stores have to adjust to that reality, or die. The Mad Butcher came in recently, Thomas says, and looked over the operation. 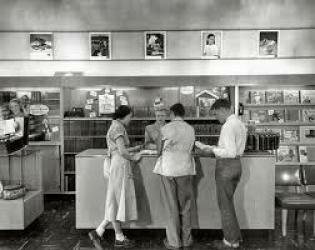 The Butcher told him to move the ticket sales office for gigs and concerts from the front door, and put it right up by the counter. That way, the ticket office serves to pull people deeper into the store. Right now, Thomas is also looking to sub-lease a chunk of the store’s vast 900 square metre floor space. “Its too big for what we need.” Again, the message is to downsize or die. Further down Cuba St, Dennis O’Brien runs the epitome of an old school record store and has been doing so successfully for nearly 30 years. He still manages the business much as he’s always done, mainly by instinct. He knows the store’s strengths – many of which revolve, he says, round the loyalty of the customers, which in turn is fostered by having good and knowledgeable staff (many of them are musicians, and/or work in local radio) behind the counter. Most of the staff have been with Slowboat for years, and they do exert a totem-like attraction of their own on the regular clientele. (Andrew Armitage and his staff run a very similar operation at Aro St Video,) Seemingly without effort, Slowboat functions as a kind of informal drop-in centre for the Cuba St community in ways that the likes of Marbecks can only dream about. O’Brien is fond of playing to a certain crusty old fogey persona – the business is not computerized at point of sale, he says almost defiantly – but the sharp business sense (and wit) is readily evident behind the façade. O’Brien successfully juggles his online and store sales, the foreign and local trade, new sales and second hand sales largely by sheer instinct and long experience – stuff that a degree at business school can’t teach. He just knows for instance, that the Eddie Cochran 45 collectable is the English pressing, and not the dodgier New Zealand pressings on the London label – “Kiwi pressings are not desirable in themselves.” Fact of life : our valuable rarities tend to be our own music, not our pressing of someone else’s. Yes, O’Brien says, business has been down this year. So much so that he doesn’t bother tracking it closely and pondering the causes anymore. “ We first noticed the downturn around June of last year….” He’s not interested in laying blame. The advent of JB Hi Fi strikes him just another unwelcome fact of life, and ne further example of the takeover of the New Zealand economy by Australians…’Aussie banks, big Aussie chain outlets, whatever.’ At 61, he worries about what he can affect. Maybe, though that sounds like a generational thing. The self-defining musical question among baby boomers may have changed from ‘What was the first single you bought’ to ‘What was the last single you bought”….as if that phase was now over for good. Yet like Alice, people are going through the mirror and finding themselves in a world where people are buying individual tracks online – not albums so much – and so, the singles cycle has begun again. And will expand, as the industry tries to figure out how to leverage as much money online as it used to do from conventional retail outlets. O’Brien still enjoys what he’s doing – but he does mull over, from time to time, the trade-offs between what the shop has always stood for, and current realities. Over staff objections, he did buy in a few new copies of the Susan Boyle album for the Christmas trade. That concession to change is one he is willing to make, much as it bothers him at a personal level. Just think, he says, of how many people are going to find that album under the Christmas tree this year. “We’d probably feel a bit ashamed if someone gave us the Susan Boyle CD for Christmas, But thousands and thousands of New Zealanders are going to unwrap it and go oh gee thanks, that’s just what I wanted, thank you so much…” You either accept those kind of realities, he says, or should be considering whether its time to get out…if its got to the point where it feels like it could be threatening the integrity of what you’ve been doing. .
That’s more or less the point, though. Is an industry that is dependent on Susan Boyle, one that can be saved?